In sports and in the weightroom, all muscles need to be strong and powerful. The body works in a series of kinetic chains to produce forceful, powerful, and coordinated movement. Nevertheless, some muscles are more important than others. And in the weightroom, prioritization is needed to make sure the lifter puts the majority of his or her efforts into the methods that deliver the biggest return. What’s the Most Important Muscle for Total Athleticism? If I had to choose one muscle, I’d say that the glutes are the most important muscle for total athleticism. After all, they’re heavily responsible for hip extension, hip external rotation, hip abduction, and posterior pelvic tilt, which means that they’re highly utilized in sprinting, jumping, landing, climbing, throwing, striking, swinging, turning, cutting from side to side, squatting, bending, lunging, cleaning, and snatching (basically all things athletic). What’s the Most Important Muscle in Sprinting? However, I’ve always felt that the hamstrings are the most important muscle for sprinting. Most sprinting researchers feel the same way. The hammies are responsible for hip extension and knee flexion, and both of these functions are needed in sprinting (out of all of the joint actions, hip extension and knee flexion torques increase the most as running velocity increases from moderate to maximal speeds). That said, it is my current belief that the hamstrings are the most important sprinting muscle in the air, whereas the gluteus maximus is the most important sprinting muscle on the ground. During the swing phase, the iliopsoas is vitally important in swinging the thigh upward, while the hamstrings are vitally important in reversing the movement and swinging the thigh downward. But once the foot hits the ground, the gluteus maximus takes over and becomes the most important hip extensor, absorbing braking and vertical forces and then rapidly producing propulsive forces. Muscular strategy shift in human running: dependence of running speed on hip and ankle muscle performance – this is one of my favorite papers on sprinting. This one is a free pdf, so I recommend that you click on the link and download the paper. Changes in muscle activity with increasing running speed – this is another excellent paper on sprinting. By the way, Chris and I reviewed both of these studies in our sprinting page. Please allow me to address each study more in depth below. In both of these papers, the researchers glossed over these findings pertaining to the glutes and failed to recognize the significance of their data. At any rate, it is my hope that future research is conducted to model the muscular contributions to horizontal force production during the stance phase of maximum acceleration and maximum speed sprinting. I think it’s obvious that we’ll find that the glutes are major players (the hamstrings would too with their contribution to both hip extension and knee flexion torques). It would be nice if the Dorn paper was extended to examine the contributors to the swing phase in both hip flexion and hip extension (as they did) in addition to vertical and horizontal force production during the stance phase (they only examined vertical) with both maximum acceleration sprinting and maximum speed sprinting (they looked at varying speeds, topping out at max speed, but did not examine acceleration), examining all of the major players including hams, glutes, adductors, hip flexors, quads, calves, soleus, and tibialis (they didn’t include the rectus femoris or adductors). This would probably need to be split up into a maximum acceleration study and a maximum speed study as the task of data analysis would be insane. And as I mentioned in THIS article on glute science, I hope that researchers examine the gluteus maximus moment arms and PCSA in sprinters and utilize this data to model their muscle force and hip extension torque potential. Using data on old cadavers will dramatically underestimate their neuromuscular force and power in addition to their contributions to hip extension torque and horizontal force production. Not only is he the glute guy, he also blogs in the future! (Just noticed your post’s date). Interesting article. I never thought of the differences between glute/ham muscle activation during the phases of gait in consideration to sprinting. I’m looking forward to further research. Information like this is really awesome. For me, because of my interest in speed and athleticism, it calls into question the merits of heavy squatting and deadlifting to develop superior athletes. While I have hung my hat on these lifts and cannot deny their contribution to my physique, both have come at the price of a few injuries and make me wonder if the same results couldn’t have been achieved with less setbacks. I work with untrained individuals and a few high school athletes with whom I try to instruct proper squat and deadlift form but feel that time would be spent better with hip thrusting for glutes and hyperextending for hamstrings. It seems to me that these lifts would not only lead to hypertrophy and strength gains in the most important muscles for athleticism, but do so without high risk of injury and a large learning curve. Bret, what do you think? The above article is also my favorite on sprinting. I cannot believe it has not been talked about more. Your take on the importance of glute strength is something I have overlooked. I was blown away by the amount of force the iliopsoas generate. Especially since no one has really been serious about training them (except the Jamaicans – it is amazing what people without computer models, armed with only objective observation can do). Also the second order trends of the hip extenders as speed increases is amazing. I would love to see the numbers for guys like Gay, Gatlin, and Bolt. One thing I cannot believe is how the adductor magnus has been over looked. It has the largest moment arm of the hip! Future research on the subject will be fascinating. A little unfair on Tyson Gay. No rip on Tyson Gay what so ever. His training is obviously effective. More just a criticism on sprinting/ running gurus who say one needs only loose hip flexors or that hip flexion is passive. I am just curious if hip flexion strength is a large issue for people who are strong with squats and deadlifts but are slow, or with more focused work fast people can be faster. Squats, glute work, and pylometrics are without a doubt effective and necessary. However, I’m fairly certain the hip flexors are the difference between a strong third stringer and a fast second or first stringer for a good percentage of kids. The data available definitely suggests further investigation is warranted. From what I have read, hip flexor strength has been reported in scientific literature to be the number one limiting factor to sprint speed development. An athlete can be extremely strong and still not be very powerful. Remember speed needs elastic strength. This is something lifting huge weights (squats and deadlifts) doesn’t leave much room for. Hamstrings/Glute Max assist in DEceleration of hip flexion, so you might want to think more in terms of ‘stretch’ as opposed to ‘strengthen’. Prior investigated by hortobagyi et al in 1985, where the investigation showed increased flexibility of the quads and hamstrings, showed in improvement in knee extension speed, decrease in relaxation time and increase in stride frequency during sprint. They concluded reduced stiffness of the hamstring in midrange allowed more efficient application of quad torque in overcoming external load. Therefore increased flexibility of the hamstrings effectively allowed extension to occur more rapidly. Great review, can I join a mailer? Hamstrings undergo stretch in forward swing and change from eccentric to concentric action as the foot nears ground contact. Glutes also have an eccentric phase during forward swing. Hamstrings attempt to flex the knee as the foot nears ground contact to reduce braking forces. In addition the late concentric power of the ham is accentuated by the stretch shortening that occurs during the eccentric portion of the swing. Some studies indicate that peak power is generated in the glutes during late swing. Others indicate peak power during the braking phase. The glutes “turn off” during maximum speed sprinting as the ipsilateral foot passes under the COG of the body. It is at this point that the braking phase becomes the propulsive phase. The glute is not very active at all during the propulsive phase. The hamstring is active, however, until near toe off. There is a powerful extension moment of the hips during the breaking phase where the glutes are involved. At this point the glute acts as a stabilizer to keep the contralateral hip from dropping and acts to keep the torso from rotating forward during the braking phase. The extensor (Lombard’s) paradox also contributes to the extensor moment at the hip, but this is still initiated during the braking phase as the COG moves forward over the support leg. Once the ipsilateral foot passes under the COG, the propulsive phase of ground contact begins. At this point, the hamstrings are the most active muscles until toe off. The adductor is a synergist to the glute in assisting in hip extension during the late swing phase. It counteracts the abducting tendency of the glute and assists in directing the force vector and speed of the swing leg until ground contact. Once the ipsilateral foot is grounded, the abducting capacity of the glute is restricted, and the adductor is no longer needed. The hip flexors are important for swing leg speed and to achieve the proper “high knee” position in front side mechanics to facilitate effective and efficient swing to ground contact. Agree with almost all of this jhowser and have read the various papers which have shaped your biomechanical knowledge. I’ve always been a bit skeptical of the adductor/glute max synergist theory, but I suppose it does make sense. One paper mentioned that in gait, half-way through the stance phase, the hip runs out of ROM in extension. This is why there’s a switch from hip extensor moment to hip flexor moment. This would explain why glutes shut down, and hammies could stay on with knee flexion torque at this point. Good stuff! Thanks for the reply Bret. As you mentioned, the glutes lose their mechanical advantage during stance as the COG passes over the grounded foot. The glute is overlooked as a stabilizer at ground contact. It certainly keeps the contralateral hip from dropping as the contralateral leg is swinging, but it has an even greater postural significance in keeping the torso from counter-rotating forward as the swing leg contacts the ground. Regarding the adductor/glute synergist theory, if you watch the Jamaicans sprint from the front, the swing leg knee swings to center at knee apex more than most American sprinters. With the exception of Veronica Campbell Brown, nearly all of the “younger” Jamaican sprinters exhibit this technique. Sprinters from both Steve Francis and Glen Mills exhibit these mechanics. Tyson Gay’s earlier technique had less “centering” than he currently exhibits. His improvement coincidentally occurred simultaneously with his technical modification. Adductor activity should be greater during terminal swing if the knee is more centered. Thanks for your reply, and thanks for being the most reasonable voice for research that is currently available. Your open mindedness is extremely rare in this “testosterone-laden” business and your quest for information is truly unique. Your articles and blogs are a great resource to stimulate creativity. Enjoy all your stuff! jfhowser, again, great reply (and thanks for the kind words!). Couple things – first a semantics issue. I wouldn’t say that the glutes lose their mechanical advantage as the COM passes over the stance leg, I’d say that the hip simply reaches full extension and runs out of ROM. The internal moment arm (leverage) for the gluteus maximus is actually better at full hip extension compared to when in hip flexion, so it has a better mechanical advantage on the ground compared to when in the air (but when it runs out of ROM, it can no longer produce hip ext torque). And second, I’m aware of the counter-rotation theory, but interestingly, the article that I linked above (from the quote about the glutes being a Swiss army knife) indicates that the glute max isn’t affected by trunk pitch in running/sprinting, suggesting that the role of counter-rotating the torso is exaggerated. Thought you’d be interested in that. But the glute max’s abductor/external rotation roles are huge in providing frontal plane stabilization to the pelvis and femur as you’ve indicated, and this is overlooked by many. Very interesting regarding your observation of Jamaican sprinters. Seems that this is a natural rhythm that would need to be unlearned (which is probably unnecessary). Thanks again for the kind words, I really appreciate them. I hate to be a downer, but I bet the two pictures with Tyson are photoshopped. You can even see the track white line being deformed a bit in the second picture due to the liquify effect. That doesn’t mean the glutes aren’t mega important, but why resort to Photoshop? It’s so silly. Raptor, you’re definitely not being a downer. I actually thought they looked photoshopped and brought my two employees over to look at the pics. We were debating whether they were photoshopped, and we even looked at videos of him sprinting and walking around (where his glutes didn’t look as big). But we couldn’t tell that they were photoshopped and couldn’t find original pics to ascertain that they were doctored, so I went with them. Have you located the originals? If so, I’ll update the article immediately. Hey, Bret. I just read the recent research publication by Bartlett, Sumner, Ellis, and Kram. The subjects used in the research for the sprint portion were volunteers who were aged 22-40 with no stated athletic background. The maximum sprint speeds for these subjects were 4.86-5.70 meters per second. That means the maximum speed achieved by any of the subjects is slightly faster than a 5 minute mile pace. This is pedestrian! From a performance standpoint, utilizing information from this study to attempt to create any type of training model would be quite senseless. If you go to the driving range and notice a duffer who drives the ball 100-150yds and a different golfer who drives the ball 250-300yds, which golfer’s mechanics do you want to observe and replicate? Certainly not the duffer if you wish to improve your driving distance. Perhaps at some time in the future, you could give your opinion regarding the medical community’s propensity for conducting research using subjects which have little relevance to proper movement or performance. If I want to develop a training model for movement, I want to know how the “good” athletes move, not the “average joe” who volunteers in a physical education class. If I want to know the synchrony of muscle activation that results in fast running, I certainly don’t want to consider the activation patterns of anyone who runs slower than 9.5 meters per second. Find someone who does something well….determine how they move to make them proficient in what they do…..and build your training model from that. jfhowser – I think this was during acceleration over a 30m runway, so the speeds might not be as pathetic as you imagined… And if I recall correctly, the study showed increased glute activity in upper GMax, lower Gmax, and GMed across all speeds of gait, and that the inferior glutes might be associated with controlling trunk pitch at faster speeds (might be more applicable to elite sprinters). Anyway, these researchers are more concerned with normal folks (and the functions of the glutes with normal individuals). However, I completely agree with you. 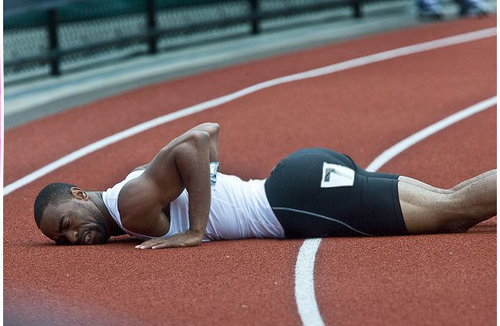 To know how the glutes function in elite sprinters, you must test elite sprinters. Very few researchers have been able to do so experimentally…Mann, Morin, and a couple more to my knowledge. We need more of this testing, but it’s not always easy to examine the best of the best. Great reply, I appreciate your input! Nobody knows…it’s an exercise that has value, how much impact we are still waiting after 4 years to see a spike in improvement. Thanks for the reply. True that the speed was measured over a 30m runway, but maximum speed was recorded and most “untrained volunteers” will reach max speed by 30m of acceleration. Also, the MT force graphs in Shache’s paper are a little skewed as they are not equal and visually comparable. 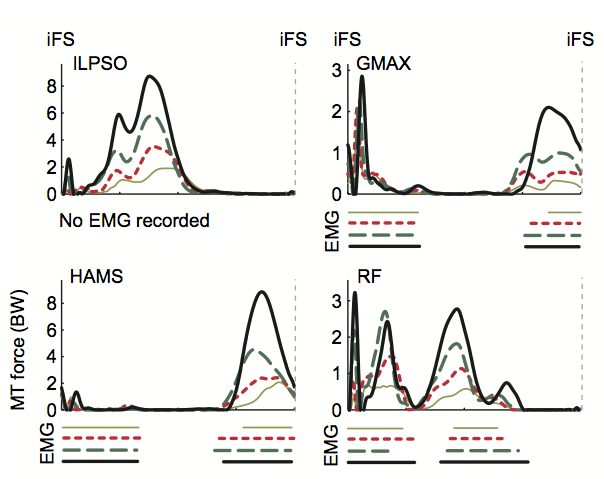 The ILPSO and HAMS are scaled to 8 and the GMAX and RF are scaled to 3. Elite sprinters can continue to accelerate until 60-70, although most are beginning to slow slightly by 70 and certainly by 80 because of neural fatigue. Most D1 field sport athletes will reach max speed at around 40m, although a few can accelerate to 50. At greater maximum running speeds there is much more upper leg rotational speed which would result in a greater tendency for the torso to rotate forward during the braking phase at ground contact. Frans Bosch will frequently comment on this during his presentations. In the USTFCCA Track and Field Academy Certification Course on Biomechanics “Sports Science for Speed and Power Events” (supposedly more difficult than the IAAF certification course) this is also mentioned. If you get a chance you should try to sit in on that course. Boo Schexnayder does and excellent job with the Academy and that course. The hip extension moment at and immediately following ground contact (during the braking phase) is considered by many sprint experts to be the result of the body attempting to minimize vertical drop, prevent counter-rotation, and stabilize during braking. Hence the simultaneous quad activity. The glutes fire extensively during the braking phase, but dim down as the COG moves toward and over the support foot. As the athlete moves into the propulsion phase of ground contact, glute activity is greatly reduced or is non existent. Jan Melen has compiled some excellent data which compares angles and rotational speeds of sprinters of varying abilities. Don’t know if you’ve seen that, but it makes for interesting and counter-intuitive reading. My issue with the medical industry is that they read research papers and make “absolute” decisions regarding firing and movement patterns without considering the subjects. I constantly encounter PT’s who cite studies where PE class volunteers were used who were “snail-like.” Or the studies will examine 3-4 subjects with 2-3 trials each. They them attempt to train movement patterns in athletes based on the results of studies done on non-athletes. I have observed a PT training a rehabbing athlete to run with extremely exaggerated forward lean and cueing the athlete to attempt to avoid using their hip flexors or hamstrings at all. It seems as if this is currently more the norm than the exception. Where is this coming from? Thanks again for your reply, your time, your quest for knowledge, and your open mindedness. Always enjoyable and interesting! Great points jhowser! I agree about your acceleration comment (I recall from a couple studies that NFL and pro rugby guys do reach top speed within 30m). I would love to sit in on that course from Boo, I never heard of it until now. Thanks for the heads up. Appreciate the heads-up on Melen’s data as well. Could call about the research; a good scientists values literature but is aware of each study’s strengths and limitations. It’s all a big puzzle, and each study fills in a small piece. Good exchange! BTW, I train a number of D1 athletic teams and several world class sprinters. We use your hip thrusts and variations thereof. Lots of bang for the buck! What about the importance of plantar flexors in sprinting speed, for resisting braking forces, keeping legs stiff, and keeping ground contact time to a minimum? The gastroc activation looks very high in the chart also? To be honest I think you guy’s are just over complicating things with all the breakdown analysis of the biomechanics of sprinting. I personally would say that power to weight ratio’s are more important to the grand scheme of things. That and looking at the 100m as a speed endurance event. At the end of the day much of who wins or loses comes down to who can maintain max speed for the longest and decelerate the least. All athletes will hit their max speed at different points in the race for various reasons. Most will take around the same number of strides and have almost identical cadence. Of course there will be some slight differences due to individual biomechanical advantages, or disadvantages and psychological toughness – but in the grand scheme of things a bigger heavier guy has to produce a lot more force relative to their lean muscle to fat ratio’s to produce the same kind of effective forward velocity than a smaller lighter guy. Which in itself is energy sapping. As long as you’re not overstriding I see no need to perfect running mechanics – the main reason being that what is generally deemed as perfect running mechanics doesn’t seem to take into account an individuals genetic makeup eg limb length’s, muscle tendon and muscle belly lengths etc… which can easily come across as being contrary to the accepeted school of perfect form and effecient running mechanics, even with an experienced coaches eye. Just look at what they said about Michael Johnson’s form? And for the life of me I cannot see how weighted hip thrusts carry over to increased sprint speed when you are simply not applying force at the same angles as you would do when in a upright position. Surely the relative muscle contribution/involvement of prime movers, synergist and fixators differ to that of sprint mechanics in a more upright position? Plus they’re damned uncomfortable. If you just want to activate the glutes in a particular sequence, then I suggest doing some simple glute exercises in your warm-up followed by some sprint strides to reaffirm the recruitment sequence. I do X band lateral walks, single leg hip thrust (body weight only) and standing single leg hip extension with a resistance band, followed by some broad jump stops for dynamic activation and eccentric loading. And those EMG graphs don’t actually prove which muscles contribute to forward velocity, only which muscles produced the most amount of activity, regardless of their role. And just to point one glaringly obvious fact that most people have failed to mention, the main reason for improved sprint times is the use of steroids. Gatlin, Gay, Asafa Powel, Yohan Blake, Veronica Campbell Brown etc… as mentioned above, have all served bans for banned substances. As have pretty much most of the former 100m/200m world record holders and Olympic medalist. Of which many of those who haven’t been officially caught, suspended or sanctioned, have since been implicated in the use of banned substances in one way or another. Times seem to improve when power to weight ratio’s increase, along with prolonged speed endurance. Actual running mechanics seem far less important, as does trying to single out any one individual muscles contribution in such a complex interchangeable chain reaction. If you need to be powerful out of the blocks then train squats, squat jumps and drop/depth jumps. Once up and running emphasise the posterior chain in a more upright position and train power/power endurance – I use deads, clean pulls and dimel deadlifts (high reps short recoveries on the dimels eg 5 x 10 with 20sec recoveries). Then use the track to emphasise phases, speed, speed endurance. I have toyed with unilateral work in the gym but to be honest I found that you could produce more speed/power with the bilateral stuff as well as reduce the risk of injury. And as for those weighted hip thrusts, I tried them and managed 150kg for sets of 10reps on my very first attempt. So I’m guessing that my glutes where already pretty strong from doing the deads and squats. Pretty sure I could gone heavier as well, but the pain was excrutiating. Not worth it in my opinion. Much better to do body weight or resistance band for glute activation with frequency. i.e I use them to warm-up with. Oh, and there’s no way you can reach top speed in 30m – even your average person will still be accelerating at that point – 40m is more like it for the average Joe. Many good points made Darren. You’re a smart guy. With resistance training, it seems you can either have similar posture with the wrong vector, or similar vector with the wrong posture, or both but it doesn’t quite feel right, etc. We all have our theories, but we need training studies to show what actually does happen. My theory could be wrong, and your theory could be wrong, but I suspect that best results for most athletes (maybe not elite sprinters) would be realized by doing both squats and hip thrusts. With regards to the pain and uncomfortable nature, you can make it way more comfortable by purchasing a squat sponge, etc. (see here: https://www.youtube.com/watch?v=aO9pnw7cBls). Agree with most of what you said though. Out of all the variables I’ve seen in the research, relative horizontal power in sprinting is the most highly correlated factor with speed and performance. I appreciate your insight! Why are you using Tyson gay? Tyson Gay tested positive for Steroids.